For a while, it seemed like everything that Phil Lord and Christopher Miller touched turned to gold, adapting difficult source material – from a children’s book (“Cloudy with a Chance of Meatballs”), to a cheesy ‘80s cop drama (“21 Jump Street”), to a popular toy brand (“The LEGO Movie”) – into successful comedies with a flair for visual gags. But they haven’t had quite the same luck with sequels, as evidenced with their work on “Cloudy with a Chance of Meatballs 2” (albeit only as writers and producers) and their latest film, “22 Jump Street.” Lord and Miller were reportedly so busy making “The LEGO Movie” that they didn’t have time to do script revisions on the buddy cop comedy, and that was a major oversight on their part, because “22 Jump Street” is a fitfully funny sequel that lacks the surprise factor of its predecessor. 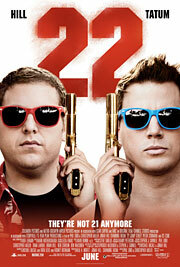 After going undercover at their old high school to bust up a drug ring, Jenko (Channing Tatum) and Schmidt (Jonah Hill) have been assigned more grown-up police work, only to end up humiliating themselves and the department in the process. So instead, they’re shipped back to the Jump Street program (having moved to the Vietnamese church across the street, hence the address and title change) to “do exactly what [they] did the last time.” The only difference is that now they’re going undercover at the local city college to find the source of a new synthetic drug called WhyPhy (pronounced “Wi-Fi”) that resulted in the death of a student. But when Jenko becomes friends with the main suspect, football star and frat boy Zook (Wyatt Russell), his relationship with Schmidt becomes strained as they split up to investigate different leads, which threatens to derail the entire mission. 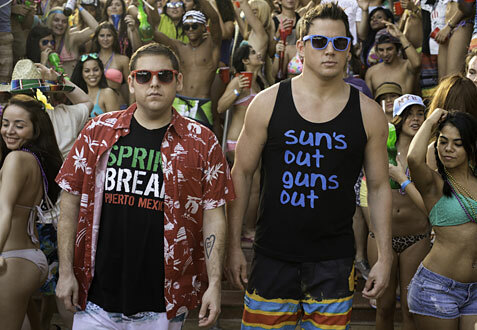 “22 Jump Street” strikes the same self-mocking tone of the first movie, this time skewering Hollywood’s formulaic sequels by openly acknowledging the rinse-and-repeat plotline and noticeably bigger budget. But while it’s a clever approach that earns some laughs (none more so than during the end credits sequence), it doesn’t change the fact that the film is still a complete retread from top to bottom. Lord and Miller inject the movie with the kind of silly and manic energy that’s become a touchstone in all their projects, but there aren’t enough truly laugh-out-loud moments, with many of the recurring jokes failing to hit their mark, including one about Jenko and Schmidt’s age that’s well beneath everyone involved. There’s also an entire subplot dedicated to the budding friendship between kindred spirits Jenko and Zook that has some really funny bits (like their sandwich and Q-tip derived “meet cute”), but it’s played to death over the course of the film’s unnecessarily long 112-minute runtime. Even when the movie starts to drag in the middle, however, there’s rarely a dull moment thanks to the chemistry of its two leads, by far one of the strangest comedy pairings ever formed, and yet the very reason why they make such a great team. Hill is a lot more annoying in this installment, especially when left to fend for himself, but Tatum is so damn funny as the loveable, dim-witted jock (like a big puppy dog that just wants to play catch all day long) that he makes every scene more enjoyable. There are some good supporting turns by Ice Cube and up-and-comer Jillian Bell as well, but “22 Jump Street” would have been miserable without Tatum’s hilarious performance. As it stands, the movie is neither good nor bad, but rather a perfectly mediocre comedy with enough laughs to remind audiences what they loved about the original while failing to justify the need for a sequel. And considering the self-aware nature of the script, they should have known better, because it’s only funny until it’s not.